Interested in using a partner? 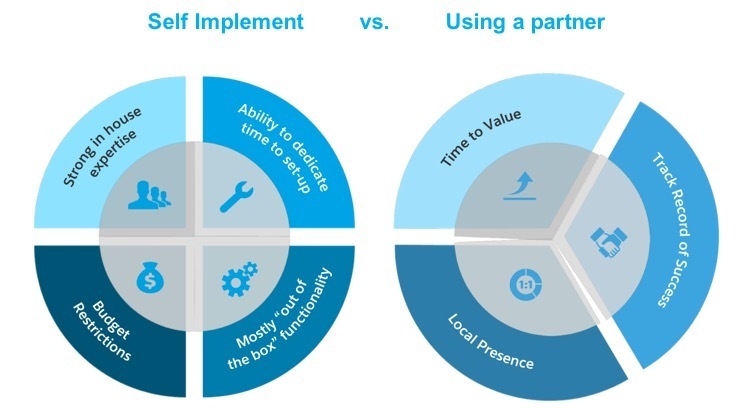 1) What is a Salesforce Implementation Partner? A certified Salesforce professional who can help you and your team configure Sales Cloud and migrate your rich data from SalesforceIQ CRM into Sales Cloud. 2) Why would I choose to work with a partner versus implementing myself? Partners are the fastest path to success because they have skills and resources to get you up and running quickly. Partners have industry and product expertise, as well connections to local resources who can assist you in person. They are also flexible and can tailor an engagement to fit your specific requirements. 3) Do you have a list of recommended partners? How do I reach out to them? Please contact our team if you would like to get in touch with the partners above. If you are interested in finding more partners outside of the ones listed above, please take a look in our AppExchange. 4) What is the process like working with a partner? The specifics vary from project to project, but typically, working with a Salesforce partner evolves the following steps: discovery with the partner to agree on objectives, outlining the project scope, agreeing to timeline and cost; configuring Sales Cloud based on your business needs; implementation review and approval; training your staff. 5) Is there a cost associated with hiring a partner? Yes, because of the amount of work these partners are investing in your project, there is a cost associated. Costs vary depending on the complexity of each project. For more information on pricing, please discuss with the partners directly.